Hover over the visualizations for more information or click them to read feedback about the individual pieces at the bottom. For best experience, view in Tableau here. At the end of each quarter, I complete an in-depth analysis of my capsule wardrobe. I’ve found this to be a helpful way to evaluate each piece to determine if it needs some TLC or if it even belongs in my closet anymore. Additionally, it’s a good way to identify trends and provide more insight into my habits and personal style evolution. 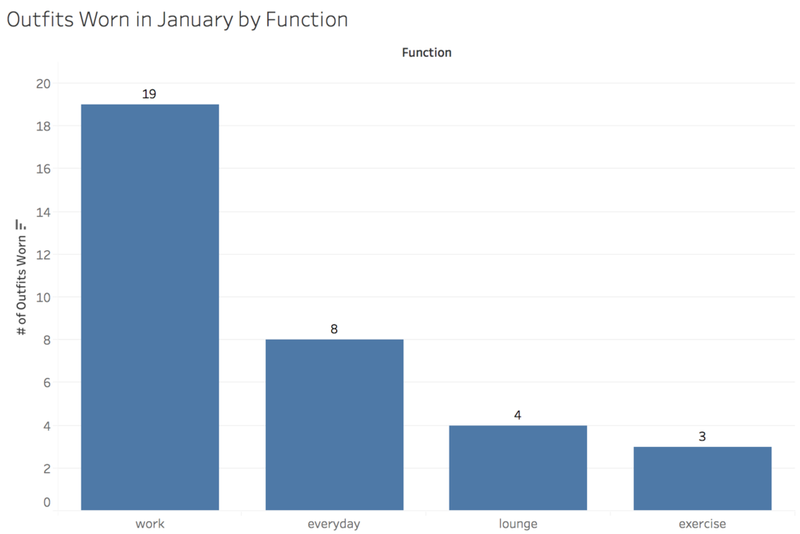 This is the first time I’ve built data visualizations to review this data and also the first time I’ve used Net Promoter Score in this way. What is Net Promoter Score or NPS? It’s a common metric used to measure how likely a person would be to recommend a product, brand, experience. You’ve probably completed an NPS survey a few times in your life without even realizing it! How likely would you be to recommend [a product, e.g. Gold Zipper] to a friend? Please respond on a scale of 0-10. Why did you choose that response? It might seem a bit odd that people who responded to the survey with a 7 or 8 would be considered “Passive” because that seems pretty high on the scale. Actually what it means is that these people may have had a good experience, but not so good that they would actively recommend or “promote” it to their friends. The score can range between -100, which would mean that every response was between a 0 or 6 (e.g. a Detractor) and +100, meaning every response was between a 9 and 10 (e.g. a Promoter). You’ll notice that I also have a column called “csat" which stands for Customer Satisfaction and rates the overall satisfaction with a product on a scale of 1-5. This is typically good for a quick “thumbs-up/thumbs-down” review of an item. I’m not currently using this data, but do collect it just in case I want to use it in the future. My favorite reason for using NPS is the ability to automatically sort open text, qualitative data. 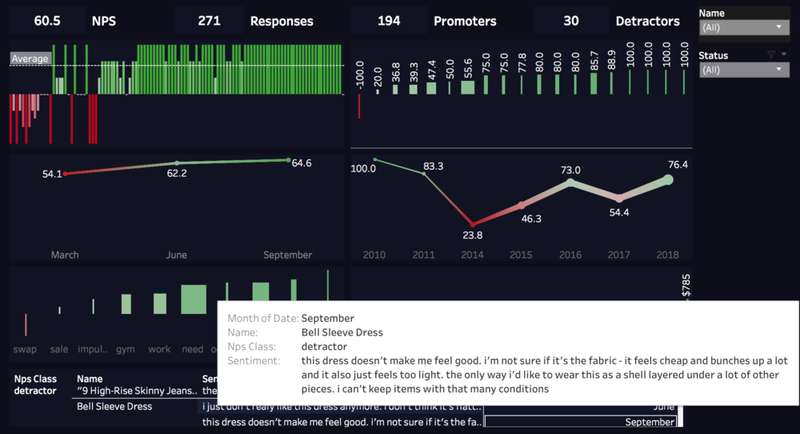 By doing this, it makes it easy to identify trends and produce actionable recommendations - even with your own wardrobe! Click on the images above to see how you can view feedback on pieces grouped by NPS classification (e.g. Detractors, Passives, and Promoters). Pieces that were purchased specifically for work, the gym or on sale are liked less. There’s a clear divide between pieces added to my wardrobe for a specific purpose vs. pieces added because they were “cute”. There’s a misconception that capsule wardrobes need to be basic to be ultra efficient when in reality your capsule wardrobe needs to be sustainable to be ultra efficient. By sustainable, I mean that it needs to be something you’re not turning over season-to-season and something you can stick with, not just a fad that leads you relapsing to a overstuffed closet. By ultra efficient, I mean that pieces are being worn regularly, but not being over-used which leads to premature deterioration. So, why the divide between pieces purchased with a functional vs. aesthetic purpose? Looking at the data, it comes down to timing. 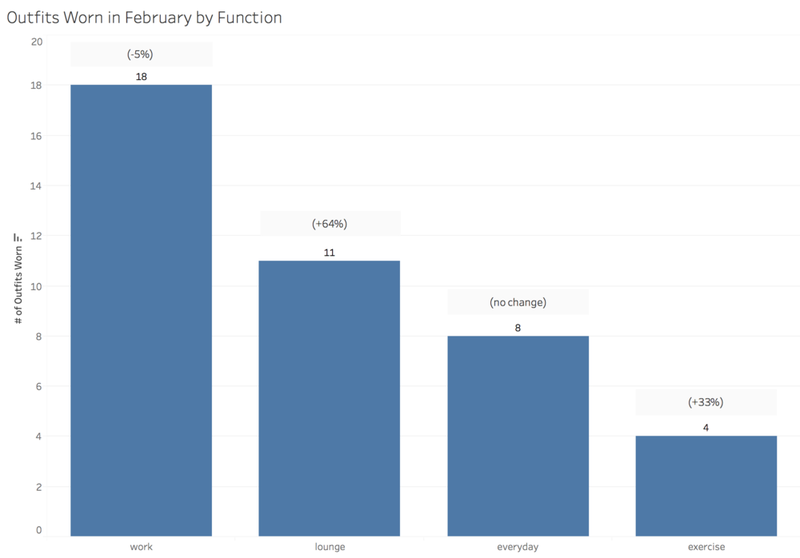 The visualization “NPS by Year Added” shows two significant dips, one in 2014 and one in 2017 which are the years I started working professionally and exercising regularly. At the time that I added these “functional" pieces to my wardrobe I didn’t know how to maintain my personal style for pieces needed for work and the gym. I had no idea, for example, that you could get a lightweight, breathable athletic turtleneck - I’d only seen tank tops and basic t-shirt styles. I’d also never seen someone with my style in a professional office setting and so instead I bought pieces that fit the setting and not me, which took up space and were hardly worn. Recommendation: Get to you know style. Pay attention to what you’re comfortable in, what you’re drawn to, what fits for your day-to-day lifestyle and carry that over to every aspect of your clothed life. Not only will it result in you being more satisfied with what you wear, it will also make your closet more efficient. One of the early mistakes I made was over-wearing a few pieces to the point of pre-mature deterioration because my closet was too lean and I only liked a few of my pieces. 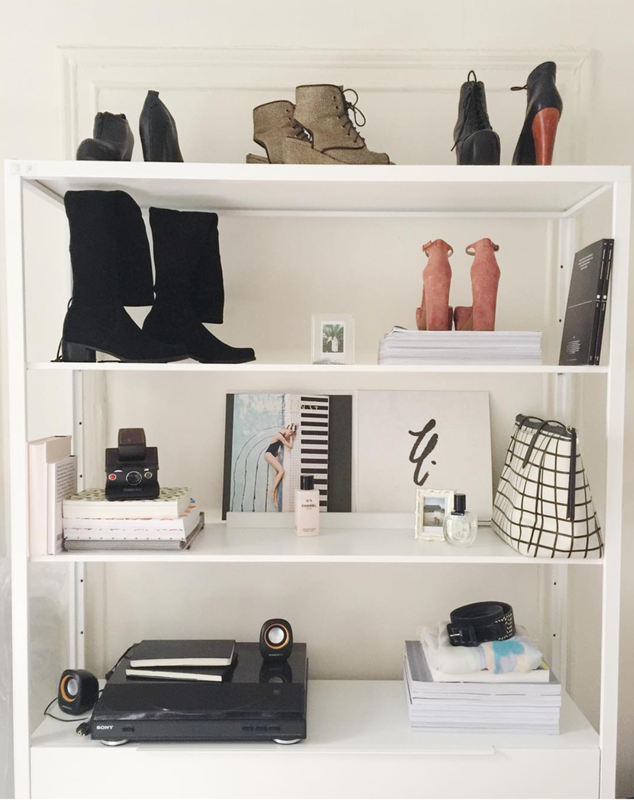 Refining your closet to something you love isn’t vain, it’s practical and efficient. Do you see any insights? Explore the dashboard and see if you can find any interesting trends or insights and share them in the comments section below! If you’re interested in conducting a similar capsule wardrobe analysis or data visualizations - check out this video I made walking through my process, here. 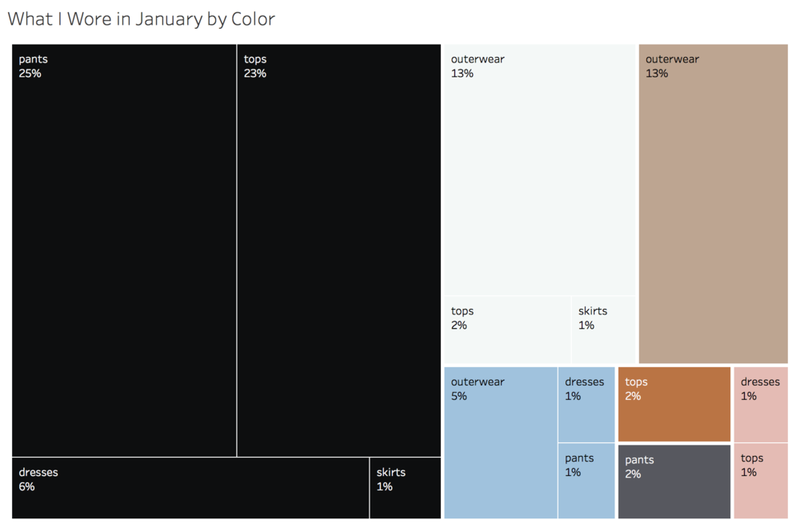 This year, I'm tracking what I wear so I can build a dataset of real-world capsule wardrobe data to analyze. I was inspired to start this project after reading an article by Torrence Boone from Google, that tracked fashion trends by Google searches. Read his article here. Now that we're over half way through the year, I now have enough data to start investigating deeper questions about my wardrobe. In the past two years I've invested in more expensive items, which is why I created today's visualization to easily view the cost-per-wear (CPW) of each piece. It's not a perfect calculation because the number of wears is year-to-date only, meaning any wears before January 1, 2018 are not included. As I continue to track what I buy, wear, and retire, the CPW will become more accurate. Test out the visualization by selecting a piece from my capsule wardrobe through the filter on the right. Insights only include pieces purchased in 2018. Cost includes the price paid for the piece and any additional costs including dry cleaning charges, tailoring, etc. Want more? Check out Michelle Wan's wardrobe project, here. Where was my capsule wardrobe made? This is a quick visualization I made last year, but recently updated with current data to show at a glance where my capsule wardrobe was made. Where was this really made? It's extremely difficult to get precise data about where most clothing is made. And even more, many brands won't list where their pieces were made on their websites, but instead just list "Imported" which I've come to find out (what I already assumed) generally means China. When I was first creating my wardrobe inventory, I emailed brands to see if I could get any more specific information on the origin, but never got anything more than a country name. The good news is that some clothing brands like Everlane, American Apparel, and VETTA do provide the actual city of origin - so where available I do track that data, but it's not represented in this visualization. For example, most of my clothing that was made in the United States was actually made in factories in Los Angeles and New York - two cities on the opposite ends of the country, but the dot looks like it's placed somewhere near Montana. I was a bit surprised to see so many dots scattered across Europe when I first loaded my data into this visualization, because I assumed most of my wardrobe was from China and other parts of Asia. When I took a closer look, I realized that a lot of my shoes (generally the more expensive ones) were made in Europe. This got me thinking about how geography plays into my wardrobe. Are more expensive pieces made in certain parts of the world? Do some countries specialize in specific types of clothing? Anecdotally, I read that a lot of basic clothing items like underwear and socks have moved from production in China to Bangladesh. My shopping habits have changed significantly since I started tracking my wardrobe in early 2017. I've become more selective about the brands I shop from and while I don't typically check where an item is made before I buy it, I do have a preference for ones that have a transparent supply chain. This visualization is very simple and a bit surface level, so I'm looking forward to do a bit deeper of analysis as my data set grows. 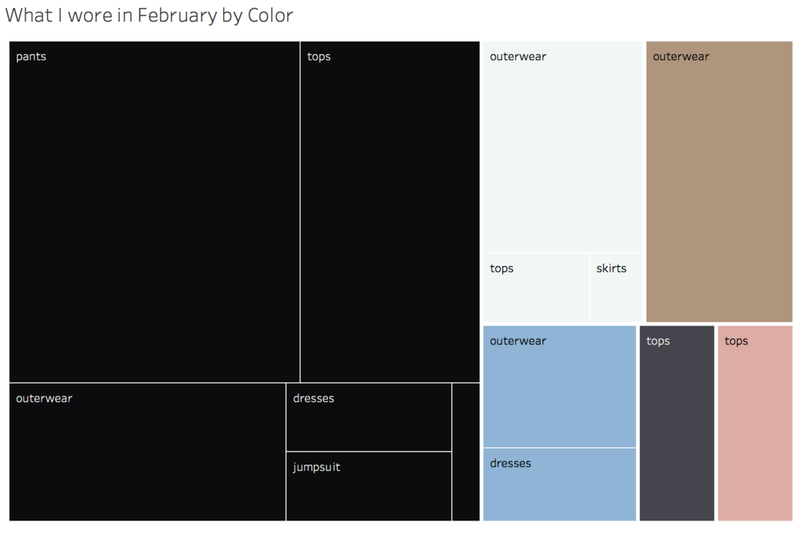 This is my first version of my capsule wardrobe dashboard featuring metrics I'm interested in tracking. It is currently updated at the end of each month and all metrics are year to date. I got the most excited about outfits that included a new piece or a combination that I hadn't worn before. Near the end of the month I purchased four new pieces and found that even the addition of one item (in this case a pair of gold hoop earrings) made me see my older clothing in a new light. I think it's good to introduce new pieces (whether swapped with friends or purchased new if they fit your standards) to keep yourself sharp and continually improving. Click the images above to view a summary of what I wore during February. Week 1: How comfortable were my shoes based on miles walked? I was excited about this metric before tracking it, but after looking at the data, it was a bit disappointing as there doesn't seem to be too much of a relationship between the two features. So, let's just talk about shoes and walking in general instead and see if there are any insights to be gained! I walk a between 3 to 4 miles everyday during the work week and, depending on the weather outside, between 5 to 8 on the weekends. For commuting, I typically wear comfortable sneakers and (usually) change into nicer shoes for the office. However, sometimes I get too ambitious? lazy? optimistic? not sure what the right word is, but sometimes I wear shoes that are not meant for walking for long distances and get blisters that take several days to heal and restrict me to wearing only my most comfortable shoes. Well, that's what happened this week when I tracked that metric. I had sore feet and didn't really travel that far since it was really cold. In short, there just wasn't enough data to draw any conclusions, so I'll bring this metric back when the weather is better (and hopefully I'm walking more) and for a longer period of time. Week 2: How often did I want to go shopping this week? This is going to be a new permanent metric. I found it so interesting because before tracking it, I was certain that I didn't think about shopping. The majority of my wardrobe is 2 years old, which means that a lot of it is starting to show some wear and tear or just isn't my style anymore. This data reveals exactly how long I think about buying something new before I pull the trigger. The reality behind this graph is that I knew I needed a new pair of shoes because a pair of flats that I rely on for work and dressier events was falling apart and unfortunately not able to be repaired. Additionally, I was down another black dress, which I also rely on for my work uniform. At first, there was a pair of bright red boots that I had my eye on for most of the month. I went to look at them a few times after work and almost pulled the trigger, but didn't because the quality and price just didn't align. I spent a lot of time thinking this month about what made sense for me, my style, and goals. 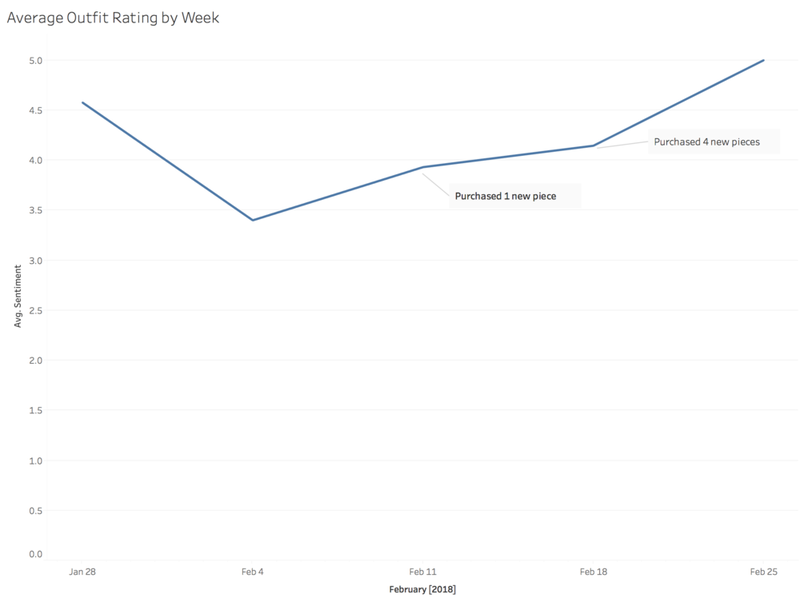 If you look at the data you can see a clear increase in desire to go shopping leading up to Feb 24. I purchased four pieces in one day after my birthday brunch with a good friend. It might have seemed like I bought a lot of stuff on a whim, but thought had gone into it before walking into the store. Week 3: How often did I cause wear & tear to my outfit? I couldn't even visualize this data because there was hardly anything there. One day, I got a deodorant mark on my black shirt and another day I spilled some spaghetti sauce on myself during lunch. Both stains were taken care of immediately. That being said, I'm still tracking this metric to see if anything interesting insights come to light. Week 4: Was I rushed to get dressed? I'm lucky in that I usually don't have to get to work too early and during the week, I wear my self-created work uniform so it doesn't take too long anyway. The one day I did have to rush was when I had a really early morning presentation at work. I'm still surprised when I can't figure out to wear because my wardrobe is small and I love so many of the pieces. I think it's the lack of novelty and the pressure we put on ourselves for occasions that brings it on. I'm really interested in participating in some swap events either with friends or my community because I think our brains crave change, fun, a challenge, or whatever magic that new clothing has. Click the images to view a summary of what I wore during January. Week 1: How long did it take to pick an outfit? It took me an average of 1 minute to pick my outfit in the morning or to plan the night before. 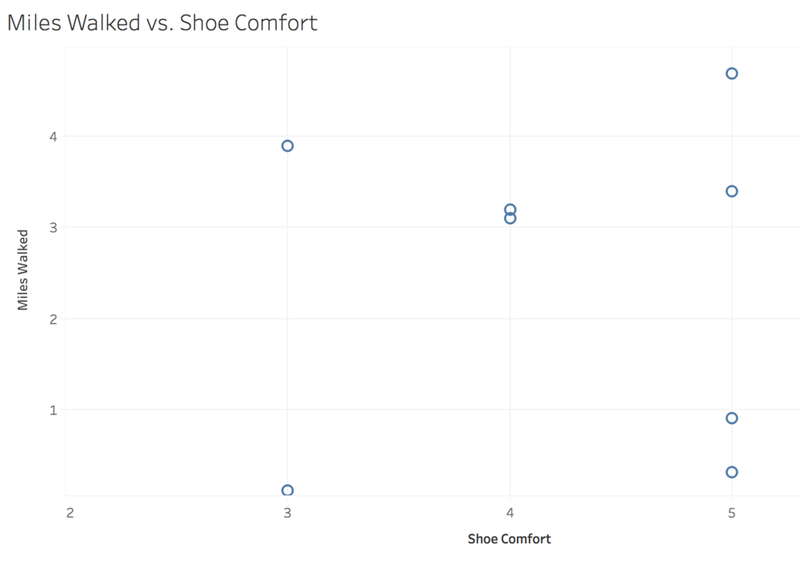 If you click the chart, you'll see there was one outlier where it took me 40 minutes. On that day, I was trying to create an outfit based on this vintage Dior hat made of crushed purple velvet. Unfortunately, I can confidently say that it's never going to work for me. Week 2: What types of comments did I get about what I wore? This was fun to track because it required paying attention to how people interacted with me, especially since the comments about my outfit were usually the first thing coworkers would say to me at work. "Your shirt is really black." - Female Coworker & Friend said because I was wearing a new black turtleneck (see here) that is darker than my other black clothing which has faded over time. "Is that your 'Times Up' outfit?" - Male Coworker said in reference to me wearing all black and the women wearing black for the sexual harassment awareness 'Times Up' movement, more information here. "You guys look so cool from behind with your jackets. I love it." - Female Coworker said as a Coworker and I were leaving for the day. I was wearing a long white trench (see here) and my coworker was wearing a long leopard trench. "You look less prissy." - Female Coworker & Friend said because I was wearing a fun lipstick with a blouse she thinks looks prissy. Week 3: Which piece did I pick first while getting dressed? This wasn't too exciting. It turns out I pick the top (dress, shirt, sweater, blouse, etc.) first while getting dressed. Week 4: What motivated the outfit I chose? The previous week I felt down, so the night before work I picked out a dress I love, but rarely wear (see here) because I knew it would get me excited to get up in the morning and feel good about myself during work. Since then, I've become interested in the motivations behind the clothes we choose to wear. A Capsule Wardrobe is any collection of clothing curated for style and quality to maximize the number of outfits you can create using a minimal amount of pieces. Defined Personal Style: Your clothes express you. Colors, silhouettes and material are all expressions of individuality. You can even express ideology. Whether that’s through something as brazen as a giant patch or something subtle like only buying from ethical vendors; it's completely up to you. Dedication to Quality: You should invest in pieces based on the quality of the product. Pay close attention to details like material, stitching, seams, linings, button holes, and zippers. Minimalism: Keep and acquire only pieces that meet your wardrobe needs. If you think it's just about decluttering, you're doing it wrong. Capsule Wardrobists typically have 60% less clothing than the average American woman, but they also understand how clothing relates to their lifestyle. When I started my capsule four years ago, I focused too much on decluttering my closet and not enough time thinking about the function and source of enjoyment of clothing. Today, I spend my time thinking about clothes more abstractly for fun rather than in stores grazing through racks looking for something to consume. When I do need to purchase something, I have a specific requirements in mind, which makes the shopping experience easier and more enjoyable. A capsule wardrobe is you expressed through clothing. I see Capsule Wardrobes as an opportunity to discover who you are and how you can communicate that to everyone you encounter. A Capsule Wardrobe isn't something you can purchase off-the-rack nor is it something you should stress about as being "unfinished". A Capsule Wardrobe is simply you - expressed through clothing, constantly evolving. I inventory and track my wardrobe through photos and a detailed spreadsheet to learn about my clothing, habits, and style. Most of my pieces are on this website, however a few have yet to be added. Below is a summary of what I own and links to the pieces published on this website.